Larry Giannechini specializes in large-scale and supertall structures in New York, Asia and the Pacific, providing construction project management services and contract negotiation for clients and owners. Previously, at Thornton Tomasetti, Larry provided performance based seismic analysis and parametric design as a New York based structural engineer. He received his Masters and Bachelors of Engineering with High Honor in Civil/Structural Engineering at Stevens Institute of Technology in Hoboken, NJ. Select projects include Ping An Finance Centre in Shenzhen and Signature Tower in Jakarta, as well as specialty installations and structural remediation in high seismic zones. Locally, Larry is interested in the advocacy for structures and spaces that positively contribute to the communities they serve and leave individuals with lasting impressions. As a former Trustee of Stevens Institute of Technology, he has been actively involved in various organizations that have roots in the AEC and real estate sector. Through attendance at community boards meetings, the ACE Mentor program, real estate forums, and the Council on Tall Buildings and Urban Habitat, Larry is involved in exploring the ways in which public policy influences and drives design. As Co-Chair of the New York “Future Leaders” Committee, Larry serves to strengthen networks among engineers, architects, and developers by expanding the circle of influence to include all vested interests in the urban environment, allowing for more informed designs. The New York Chapter steering committee met to get acquainted with new members, reflect on 2017 initiatives, and plan for 2018. 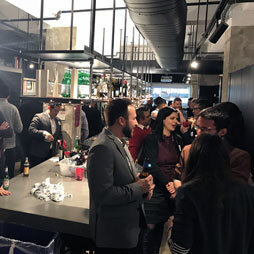 The New York Chapter held their 2017 Holiday Party, hosted by Woods Bagot. Attendees mingled, enjoyed refreshments, and celebrated a successful year. 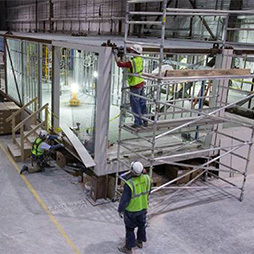 The CTBUH New York Chapter held an event focused on modular construction, which was hosted by FullStack Modular at its factory in Brooklyn. The New York Young Professionals Committee (YPC) hosted their Winter Holiday Party at the Milliken Carpet showroom, with games and activities and lots of good cheer. 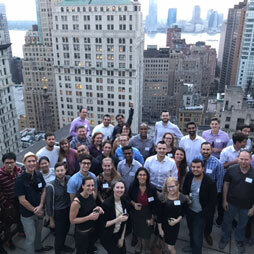 CTBUH New York Young Professional Committee held their annual Spring Social event at Bjarke Ingels Group's New York Office on April 7, 2016. CTBUH YPC held their first meeting of 2016 on March 16 at the offices of SOM to discuss the success of the past events and plans for future initiatives. CTBUH YPC hosted an event on wind engineering and understanding its effects on tall buildings as well as to provide insight into the engineering efforts in design of shorter buildings. The YPC New York held a meeting in the offices of Rafael Vinoly Architects to discuss upcoming events and other items.